Although I have been researching and practicing food photography and plating for the last month, I have not learned enough to do a great job photographing this dish! Despite a less than appetizing photo I am going to share this recipe because it is so easy and yummy. 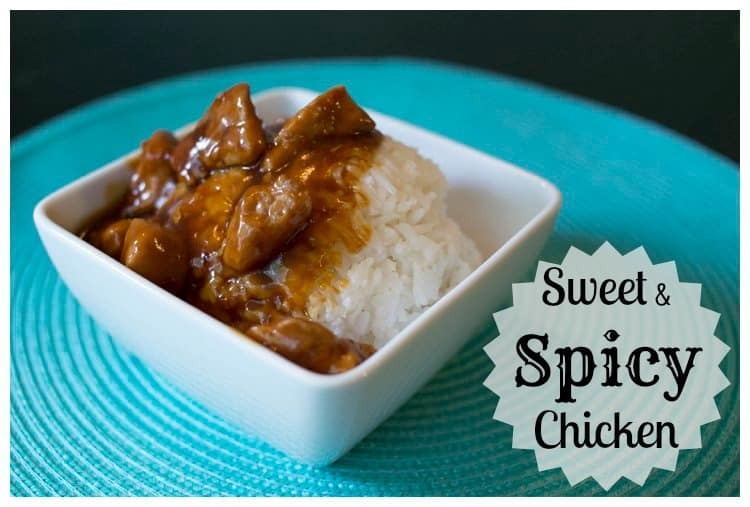 This Sweet & Spicy Chicken has just enough sweetness to appeal to the kids in my house, yet enough kick to also make the dish a favorite of the grown-ups also. Definitely adjust the amount of red pepper in the recipe to suit your family’s taste buds- the recipe below calls for the perfect amount for mine. Adults can also sprinkle extra red pepper flakes into their bowls before eating for even more kick. I love a one pot meal that is hearty and filling, especially one that is quick and easy to cook and clean up. At 31 weeks pregnant, the less time I have to spend standing in the kitchen for dinner prep and clean up the better! In a large pan, brown the cubed chicken and minced garlic in a few tablespoons of olive oil until done. Stir in in apple juice, apple cider vinegar, soy sauce, and 3/4 a cup of water. Push the chicken toward one side of the pan; on the other side of the pan whisk in the ketchup, ginger, red pepper, and brown sugar. Mix the ingredients in the pan well and heat to bubbling. Mix the remaining 1/4 cup of water and cornstarch together, then pour the mixture into the pan, whisking well to incorporate. Turn the heat up to medium high, and stir until the sauce thickens.